The Pentagon had used Okinawa to stage the 1950-53 Korean War but it was during the Vietnam War that its military build-up truly bore fruit. The first combat troops to be dispatched to South Vietnam -- including members of the 3rd Marine Division -- came from Okinawa and, over the following years, hundreds of thousands more Americans transited through Okinawa. Tragically, many of those killed in action also passed back through the island, which hosted some of the military’s mortuary services. 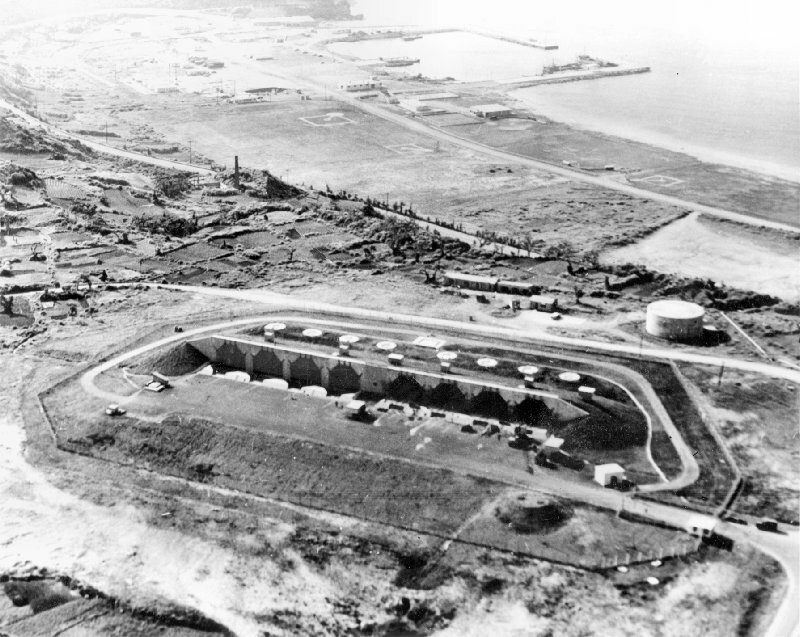 Kadena Air Base, early 1960s. 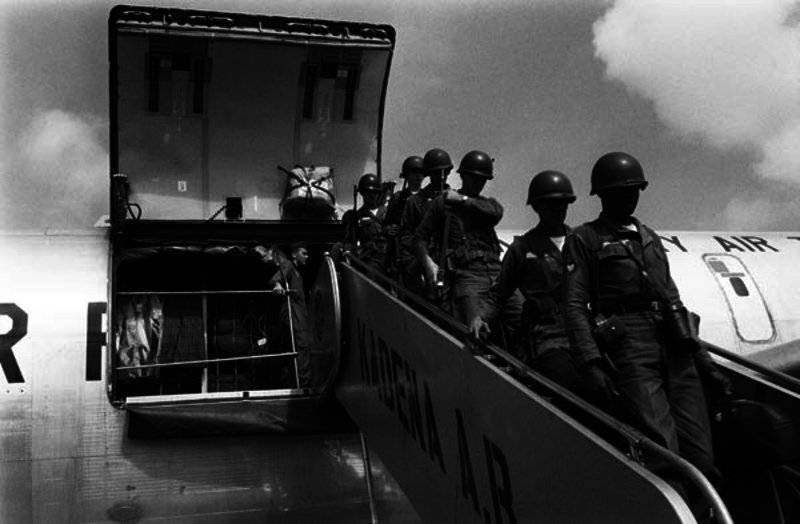 US soldiers en route to Vietnam arriving from Hawaii at Kadena, February 1962. Kichi de hataraku (Working on the bases). During the Vietnam War, Okinawa’s economic situation was bleak so many residents appreciated base jobs, which were relatively stable and well paid. Yet for many Okinawans, such labour was accompanied by a sense of complicity in the deaths of hundreds of thousands of Southeast Asians. This distress was magnified by memories of the spring 1945 Battle of Okinawa in which almost one third of the island’s civilian population had been slaughtered. Sheltering from a firefight, a US adviser talks into a radio through his bloodied mouth. Young GIs surround an enemy prisoner -- looking as scared and confused as their captive. A soldier with an M-60 machine gun lies in a field of grass reading a book -- a rare moment of tranquility in the chaos of combat. Ishikawa’s affinity with his subjects comes across in many of his images of young Americans. So strong was Ishikawa’s feelings for the GIs that, after the war, he travelled to the Vietnam War Memorial in Washington to search for the names of those he’d photographed among the granite lists of the dead. During the war, many Okinawans shared Ishikawa’s compassion towards US troops. Despite residents’ anger with the Pentagon for burdening their island with so many bases, many people befriended -- and married -- service members. In particular, there was solidarity for those who had been involuntarily conscripted and African-Americans who, many Okinawans felt, suffered discrimination from the US authorities which mirrored their own. Equally powerful as Ishikawa’s images of combat in Vietnam are those which he took on Okinawa during the war. 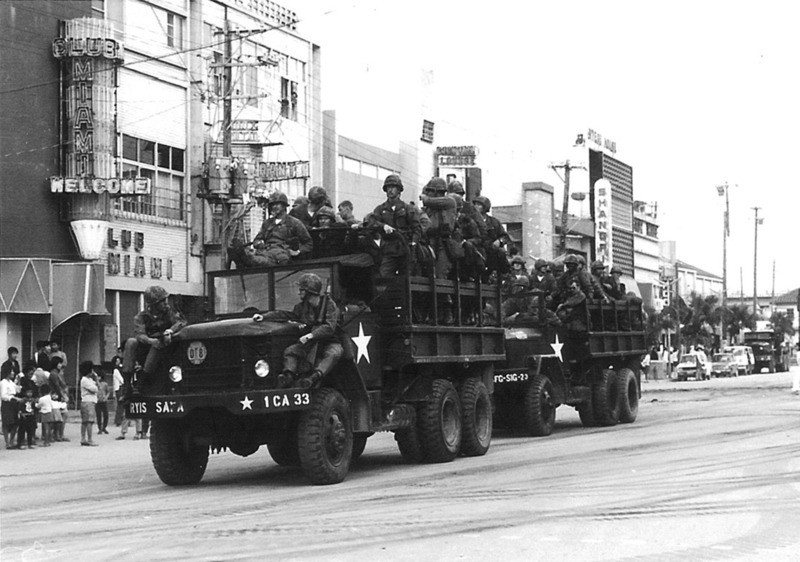 He photographed the shot-up trucks returned via Naha Port, war games in the NTA and fresh recruits preparing to go to Vietnam. “Seeing US troops heading to the war gave me very complicated feelings. On one hand, I didn’t want them to go and kill Vietnamese people but at the same time, I wanted them to come back safely to Okinawa”, Ishikawa says. However, when some of these soldiers did return to Okinawa, they brought the violence of the war back with them. One of Ishikawa’s most powerful images is called Otto ga korosareta (My husband was killed), which shows the widow of a taxi driver murdered by a GI in October 1971. As well as such violence, Okinawans bore the brunt of military accidents -- including hit-and-run auto accidents and aircraft crashes. For instance, in June 1965, a trailer dropped by parachute from a plane over Yomitan crushed an 11-year-old girl to death and in November 1967, a 4-year-old girl was run over and killed by a military crane. 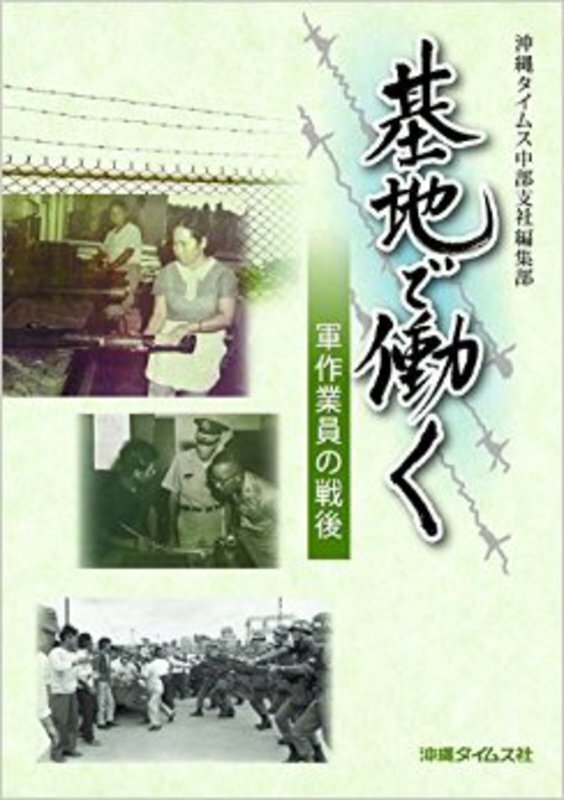 During the Vietnam War, many Okinawans threw their support behind the reversion movement that sought to return their island to Japanese rule of law. Especially, they hoped that Japan’s peace constitution would reduce the number of US bases on Okinawa and curtail their usage for the conflict in Southeast Asia. 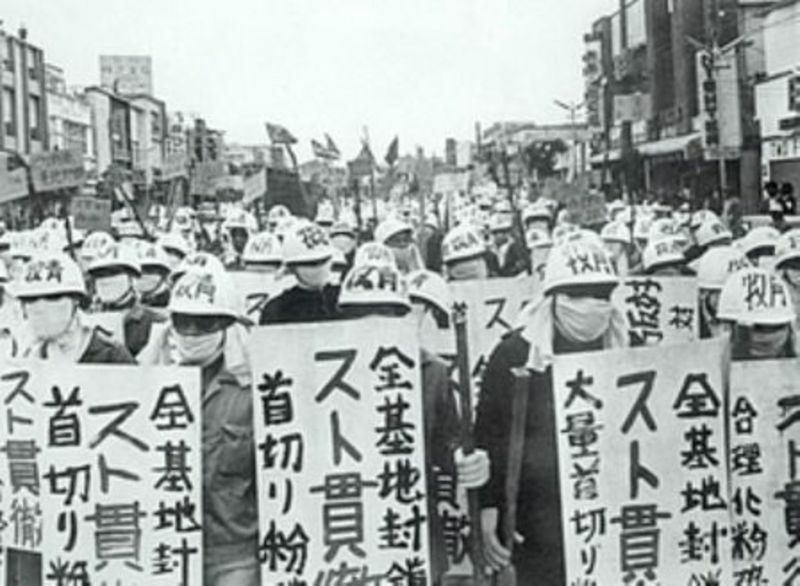 Protest against US base, before Kadena Air Base, March 1971. In 1971, Lummis traveled to Okinawa where he helped to interpret during meetings between members of the Okinawan base worker unions and GI black power groups. “The war crystallised many people’s feelings against the United States,” explains Lummis. 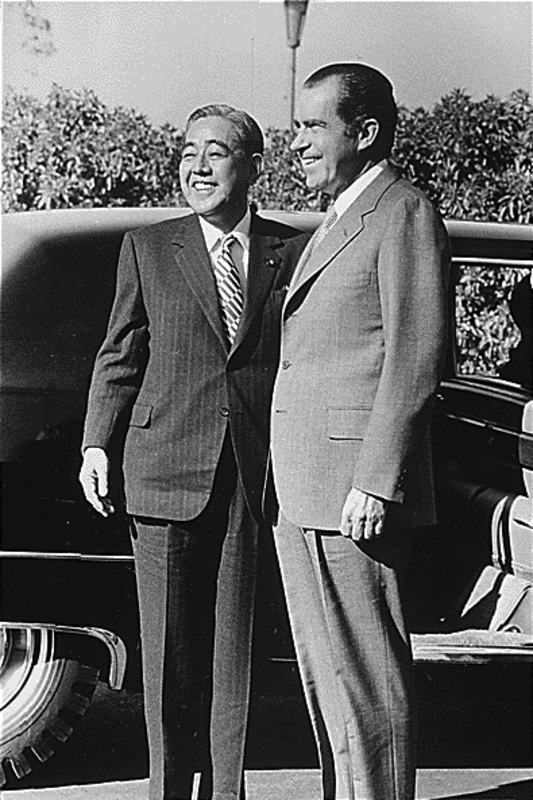 Richard Nixon and Sato Eisaku, 1972. Okinawa finally reverted to Japanese control on May 15 1972. But Okinawans soon realised the promise had been broken. Despite overwhelming public opposition, today there are plans to expand both bases. Unlike the previous bases used in the Vietnam War, these new projects are being constructed by Tokyo with Japanese tax money; further proof, according to many Okinawans, that the hondo nami promise of reversion was indeed betrayed. 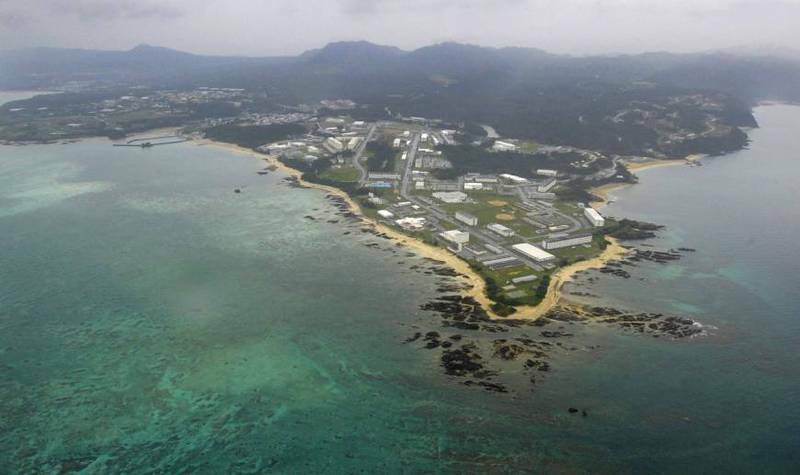 Today many of those opposing the new bases can recall firsthand how Okinawa was used during the Vietnam War -- and they vow not to let their island be exploited in such a way again. One of these is Shimabukuro Fumiko -- one of the participants in the current sit-in outside Camp Schwab. During the 1960s, Shimabukuro worked as a maid on the installation -- but the Pentagon’s aggression in Southeast Asia filled her with such a sense of complicity that she quit. Photographer Ishikawa is an equally adamant opponent of the planned installation. “If the new base is built, it will be used for future wars. Nothing has really changed since the Vietnam War -- Okinawa is still being used by the US military”, says Ishikawa. “Ishikawa Bunyo Photography Exhibit ‘The Vietnam War and Okinawa’s Bases,’” Okinawa Times (in Japanese). This is a revised and expanded article which originally appeared in The Japan Times on March 7 under the title, “Battle scars: Okinawa and the Vietnam War”. 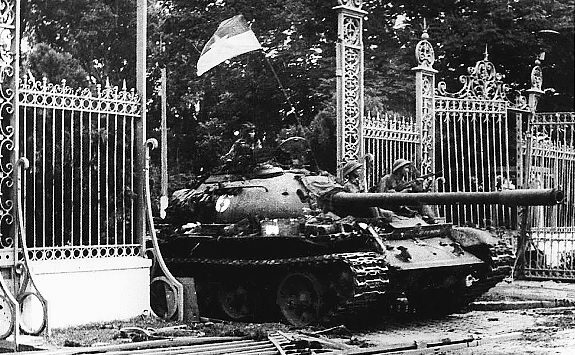 Recommended citation: Jon Mitchell, "Vietnam: Okinawa's Forgotten War", The Asia-Pacific Journal, Vol. 13, Issue 15, No. 1, April 20, 2015. 1. One of the best primers on the US involvement in Vietnam is Nick Turse, Kill Anything that Moves, (New York : Metropolitan Books 2013). 2. Quoted in Thomas R.H. Havens, Fire Across the Sea: The Vietnam War and Japan 1965-1975 (Princeton: Princeton University Press, 1987), p. 193. 6. Quoted in Havens, 85. 11. From interview with author conducted on 28 January 2015. 12. For a comprehensive, English list of US-military crimes and accidents, see here: http://www.uchinanchu.org/history/list_of_crimes.html. The list was originally compiled by the Okinawa Times. 14. From interview with author conducted on 30 January 2015. 15. Quoted in Havens, p. 52. 17. Miyume Tanji, Myth, Protest and Struggle in Okinawa (Oxon: Routledge, 2006), p. 109. 18. Stars and Stripes, “Number of SOFA Personnel Accused of Crimes on Okinawa Drops” March 3, 2015 Available here. 19. See Jon Mitchell, "Okinawa Dumpsite Offers Proof of Agent Orange: Experts Say," the Asia-Pacific Journal, Vol. 11, Issue 38, No. 1, September 23, 2013. Available here. 20. February 3 email from Michael Ard, director, MCIPAC Public Affairs Office. Ard did not respond to a further request for comment on February 23. 21. See for example the 2012 documentary about Agent Orange on Okinawa, “Defoliated Island” (Ryukyu Asahi Housou) available here.